We are so happy that we were fully booked last weekend and had some awesome guests stay with us the past couple of weeks. We had some wonderful college students stay in the Barn Loft who had a schedule packed full of adventures around the area. We are thankful for the Hot Springs Welcome center and the Rangers office who made some suggestions to them on the best hikes in the area. We’ve decided that this winter we need to take time to go on several of these recommended hikes! Maxibel French Filet Beans are Back!!! We’re excited to be offering these for your fall share. We planted them and didn’t know if the groundhog would eat this entire crop but apparently the groundhog is more fond of Kale than beans during the fall season. The groundhog has overindulged by eating over 600 kale and brussel sprout plants!!! We’re noticing that the groundhogs eat differently during fall than during the summer, in that they prefer more greens during the fall, but peppers and beans in the summer. What we wonder is if perhaps much like us, their body craves the foods that special nutrients nutrients for them to grow and thrive in different weather conditions? These beans are six to seven inches long and are harvested when the pods are the size of a pencil. 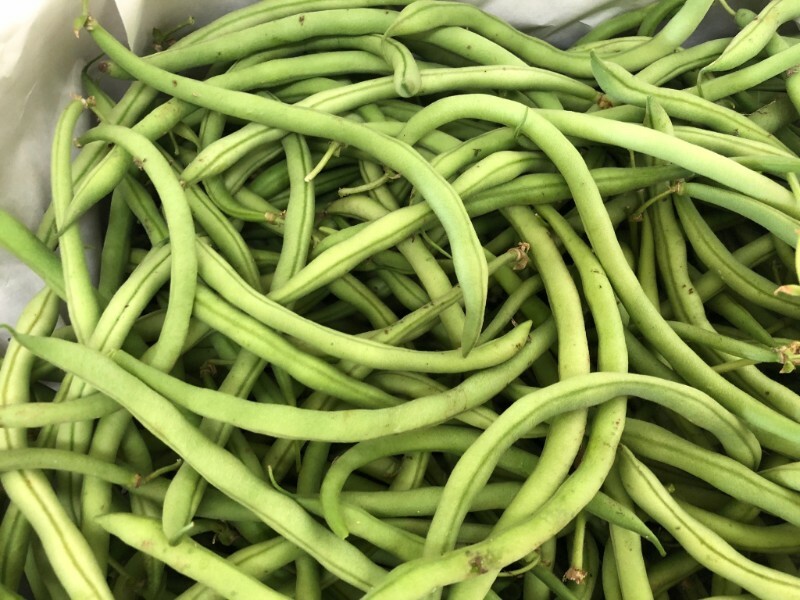 These long and slender beans are especially tender and have a well-developed bean flavor with a French flair known as Haricot Vert. Haricot is the French term for Bean and vert for green. A popular recipe for CSA Shareholders are these beans cooked with ginger and garlic. This rustic Italian salad is one we are excited for when beans, tomatoes and potatoes are available. This simple yet delicious salad is one we frequently have for a main meal. This simple recipe for vegan Szechuan Green Beans is our â€œgo toâ€ recipe for every day meals. This popular recipe for these beans is easy and delicious. We decided to dig the Carrots because they aren’t sizing up!!! Above is a photograph from a crop harvested last year, and we must say, this years carrots are smaller than we’ve harvested for the past several years. Regardless, we hope you will enjoy them, and just so you know we at MHO are eating the smallest ones!!! Being a farmer is incredibly humbling, because with all the crop failures we’ve had this year, we realize that there is still an incredible amount that we that we need to learn even after farming for 20 years. FYI… We’ve cut the tops off the carrots and are bagging them. 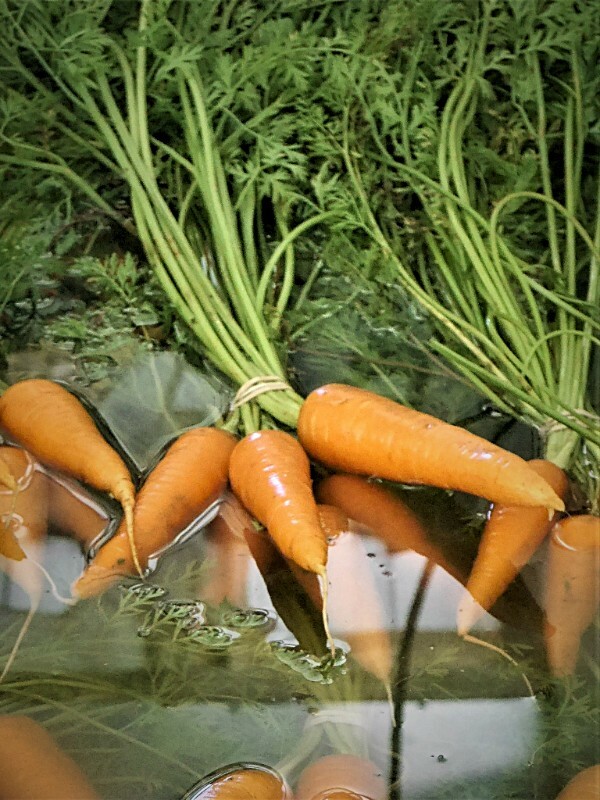 Carrots that are farm fresh, and organically grown, are sweet and delicious! We’ve washed them but you probably want to give them a good scrubbing. Since they are fresh we don’t normally peel ours but that’s a preference thing. These roots are rich in beta-carotene, which is converted into vitamin A in the liver. Vitamin A is transformed in the retina, to rhodopsin, a purple pigment necessary for night vision. We normally just cut them up and eat them in slaw, but we also enjoy them roasted. While carrots are sweet enough for our taste buds, on occasion will have candied carrots or carrot muffins.. We have rocky fields, so donâ€™t expect perfectly sized carrots in these bunches! Above are baby bells that we stuffed with homemade ricotta cheese, chorizo sausage, and scallions. 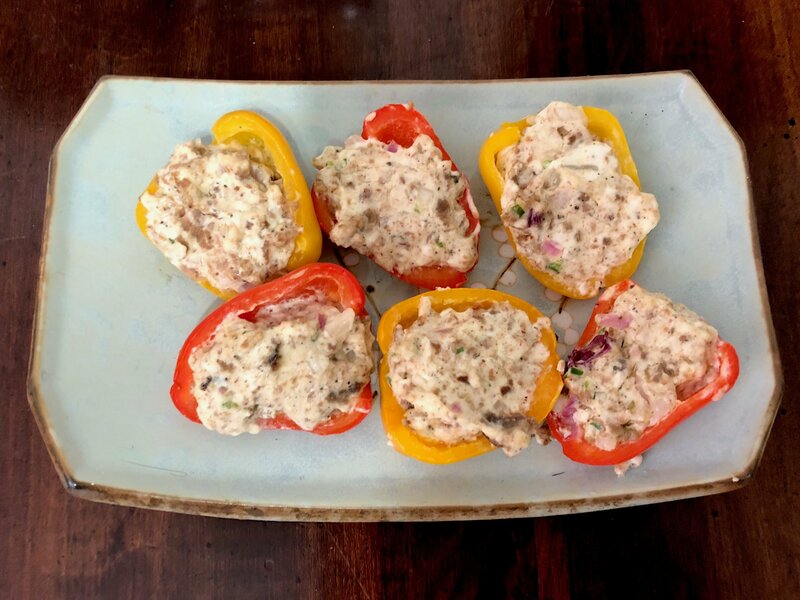 Once stuffed, we put them on the grill just until the peppers softened. Lettuce: You’re receiving salad mix again!! We’ve been eating a lot of salad mix these past couple of weeks. We simply but the mix in a bowl, nothing else, then toss with a little salad dressing. Tomatoes: Slicing Tomatoes. We’re still able to include a few slicing tomatoes in your share. French Filet Beans: These are incredibly tender!!!. Maybe you’ll want to simply steam them this week. We are hoping to harvest more for your share next week if they keep growing. Radishes: Daikon. Perfect sliced for salads or buttered for a snack. We’ve cut the tops off the daikons and are bagging them. Onions: We’l be including a mix of red bulb onions and yellow bulb onions so you can mix and match these for your salads. Basil: We are including small bunches of Thai Basil just in case you want to make spring rolls. Greens: Bok Choi. These are tender and sweet!! This green is so good in a salad or roasted. There is a possibility that we will include collard greens if the bok choi doesn’t hold until harvest. Peppers: Baby Bells. Fabulously stuffed or sliced into salads. Ground Beef: Super versatile and can be made into meatloaf, burgers or seasoning with your beans. Douglas McVey has reminded us that the monarchs are migrating!! This week our pollinating flowers are loaded with these beautiful and endangered butterflies. They are a reminder to us how fragile our environment has become and that we all need to do our part to not only protect these beauties, but all species that inhabit our planet. As we watch them feed on our flowers, we are incredibly thankful for you CSA Shareholders, and for people who either grow their own food or support small farms. 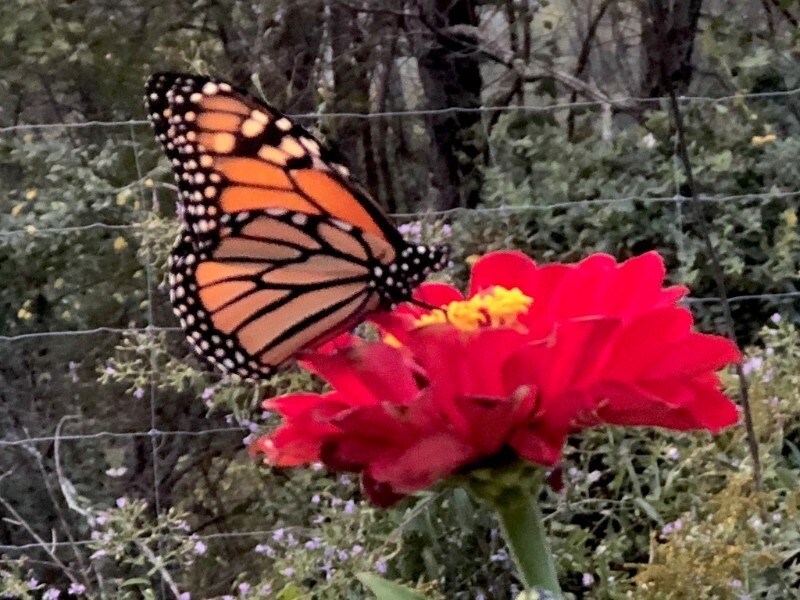 As we give farm tours to guests who stay at MHO, we explain that many small farms have a wide diversity, so there is always something flowering for our pollinators (including the monarchs). Just imagine thousand of acres of lettuce, kale, soy beans or corn (many of which are included in so much of our processed food), at any given time these vast acreages of land might be blooming for a short period (or not at all), so when those fields aren’t blooming there is no nectar food sources for our pollinators or other beneficials. Many times these fields are sprayed with pesticides or contain genetically modified BT Crops, so they will in essence kill off our pollinators. Knowing the source of how your food is produced is incredibly important for keeping our biodiversity alive!!! SO THANKS FOR SUPPORTING MHO and/or supporting small farms. Jip and Janneke are happy to be rooting around in their paddock!!! 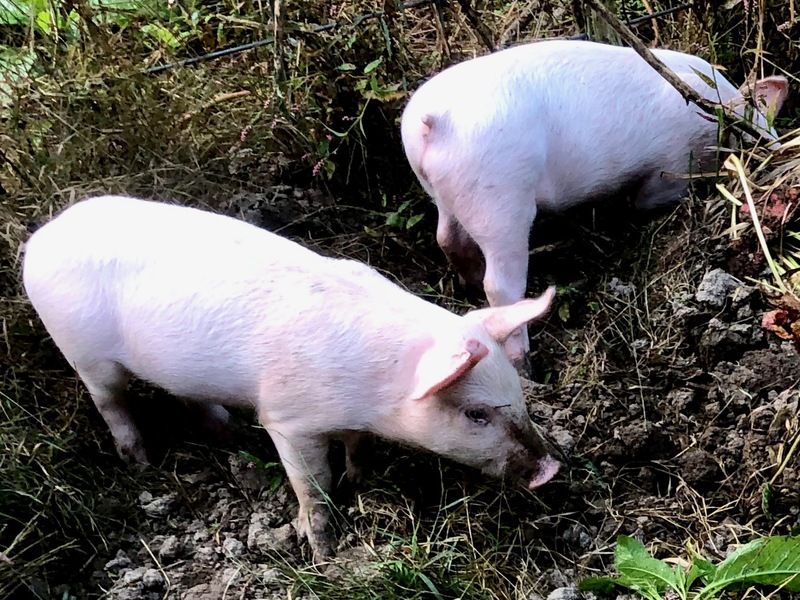 Now that these cuties have been with us a week, we’ve allowed them to begin rooting around in their paddock, and they are having a great time rooting around for bugs, nuts and plants. Some farmers put rings in their snout to prevent them from rooting, as the ring is painful for them, so they won’t root. We don’t know any farmers in our circle of small farms that use rings in preventing pigs from rooting. If you choose to eat pork, be sure you know your farmer, and support farms who raise their animals naturally. We’re excited that we got to celebrate Justin and Natalie’s wedding here at the farm!! 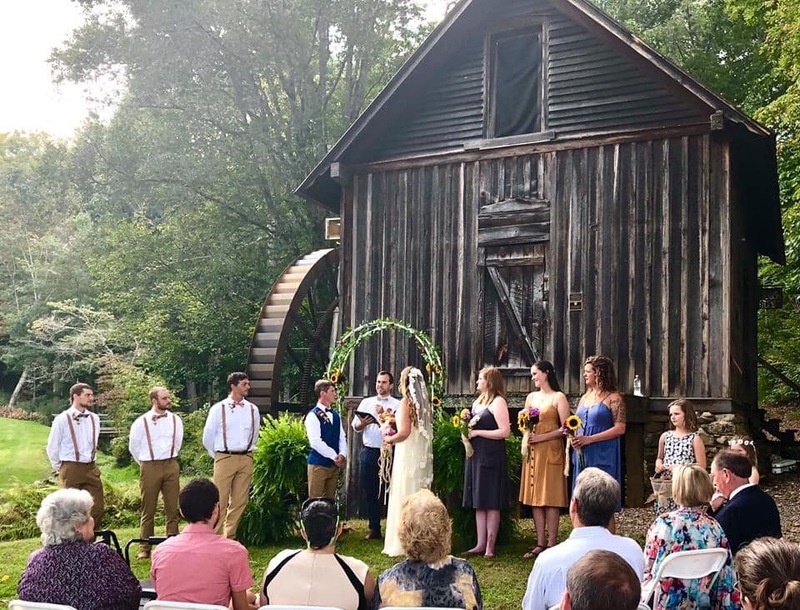 Justin, who apprenticed with us over 5 years ago, just married Natalie Boone at Natalie’s family’s grist mill in Haywood County. From the photographs we’ve seen, their scenery was extremely beautiful at Francis Grist Mill, and Justin so handsome and Natalie so beautiful. We were extremely sad that we couldn’t attend their wedding because we had to clean our accommodations that day. It is one of those days when we wished we had a real 9 to 5 job and were off on weekends. However, they came to the farm the following weekend and we celebrated with them over wood fired pizza and leftover beer from their wedding. We were also happy to donate flowers for their special day. These youngun’s are inspiring to us because their love for the outdoors (especially climbing mountains), they live a minimalist lifestyle with a small footprint on our planet, and they raise bees and grow their own food. Argus is hanging out with us while we planted strawberries!! We’ve been trying to encourage Argus to hang out with us in the field while doing field work. 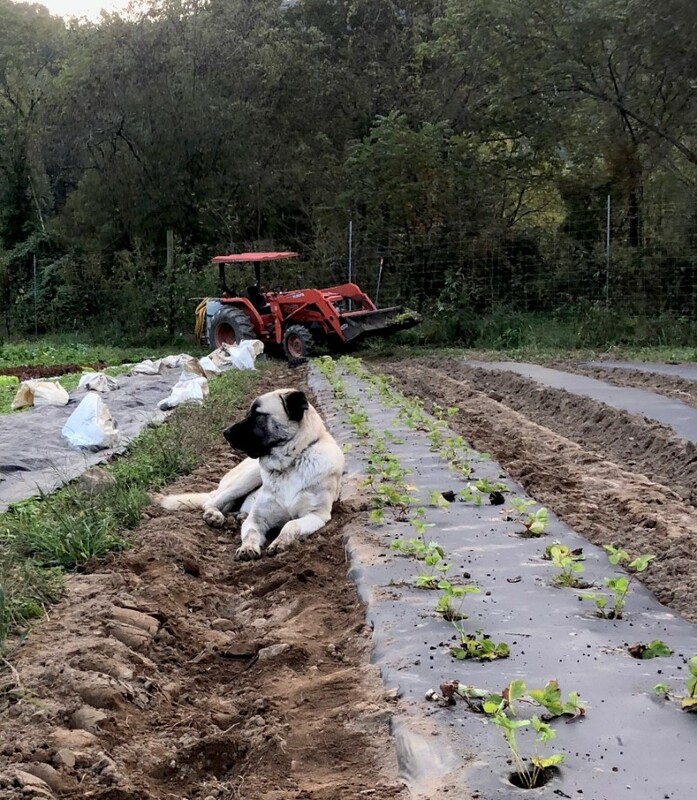 We’re not sure if it is a good thing, because it is a chore keeping him from lying on the crops or tearing the mulch on the beds that we’re using for weed prevention. Above, he is actually being good, and lying in the aisles between the beds.